Which MP’s fridge magnet is better? 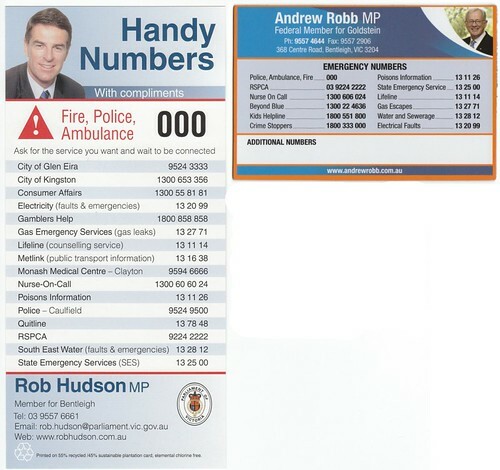 It must be an election year — in the past few weeks we’ve got fridge magnets with emergency numbers, from both our federal Member of Parliament Andrew Robb (Liberal) and also from state MP Rob Hudson (Labor). So, you know how I like to treat political issues seriously. Which fridge magnet is better? Plus space for more, but you’d need a whiteboard or permanent marker to write them in, and the space is likely to be inadequate. Andrew’s is the nicer magnet, definitely, and more useful as an actual magnet, eg for sticking things to the fridge. But Rob’s has more useful numbers on it. I’ll probably keep them both, until something better comes along. And of course, one always has the option of trimming them to remove the MP’s details, and just keep the phone numbers. Does anyone ever actually use these magnets to look up a number? I don’t think I ever have. And if I did need a number in an emergency to be honest my first thought these days would probably be the internet rather than the fridge. Andrew Robb provides a phone number to deal with “gas escapes” ? That’s almost worth sending the magnet to Media Watch. Yes it is an election year – I relaised yesterday when we received a letter from State MP (and Health Minister) Daniel Andrews (Mulgrave, ALP) suddenly saying how he’s always there to help and feel free to call if there are any issues etc, etc. Andrew Robb’s came with a little note along the lines of “I hope you never need to call these numbers”. I wonder if he was referring to his own number which is also listed on the magnet…? Due to the many times a day I pass my fridge, I’d rather look at Rob Hudson than Andrew Robb (plus I’d prefer to ignore the Liberal Party as much as possible). Well the “emergency numbers” instead of “handy numbers” might reflect the Liberals’ greater propensity to gratuitous fear-mongering. But only slightly, there is not much difference. I have gone to these magnets on occasion, generally when there’s no power and therefore no internet and then I realised how useless the magnet really was. The magnet was out of dat. par3182: people like you contribute significantly to the sorry state of politics in Australia – you’re assuring one party of a safe vote. There is no excuse for ignoring one major political party. You should at least pay enough attention to make a valid assessment of their policies. Too many people go to the polls and vote for the party they always vote for, or that their parents voted for. It doesn’t help anyone – least of all you. On top of that, Robb is a federal MP, so if you’re one of his constituents, he’s the person you need to lobby to look after your interests. Writing letters to MPs may seem futile, but if no-one bothered, they wouldn’t even know what people’s gripes are. Here here Vas! Spot on- could’t have said it better myself! Remember, those in safe seats have no need to improve their policies or do anything to EARN your vote! Those of you who complain about nothing getting done, you’ve got a chance this year to have your say at both state ad federal level! Hold their feet to the fire, hold them accountable!